The Island of Inhaca is easily accessed with daily air transfers, just 10 minutes flying time from Maputo and situated between bushycolonies of coconut trees and tropical vegetation. Pestan Inhaca Island lodge is located on the beach front, amongst coconut palm groves and luxuriant tropical vegetation, Inhaca Lodge is famous for its wonderful gardens, its warm hospitality and fabulous sea food. Inhaca Island Accommodation - The picturesque resort offers a total of 40 rooms comprising either doubles, twin bedded or larger family rooms. All the rooms have en-suite bathroom with shower and are set amongst magnificent coconut palms and exotic gardens. All the beds have mosquito net. The resort has one main Restaurant indoors, but lunch can also be served outside, on the terrace in front of the pool. A meeting room for functions and events is available for 60 persons. Equipment available: Screen, slide and overhead projector. Inhaca Island has a lot to offer, excursions can be arranged to Portuguese Island, the Biology Station, Light House Beach, the Mangrove swamps, as well as the Santa Maria Wall. Also available are Sunset cruises, Whale Watching excursions, etc. Portuguese Island is a deserted island approx. 3 km from Inhaca Island. The boat crossing only takes about 10 -15 minutes and picnic lunches can be arranged from Inhaca Lodge. Portuguese Island has beautiful beaches and the lagoon area is great for all manner of water sport's. The snorkeling is also fairly good. Santa Maria Wall (also known as Ponte Torres) is quite far from Pestana Inhaca Lodge, on the other side of the island. The boat trip takes approximately 45 minutes each way. This is actually a reef, which is really great for "drift" dives or snorkeling. The "wall" is a rocky ledge that falls steeply down to 20 meters. Best dived leading up to high tide; the jagged rocks have many caves and ledges that harbour all kinds of marine life. There is also a small village to provide some local colour or souvenir hunting. Inhaca Island is a true African Island, and an ideal weekend getaway with great appeal. 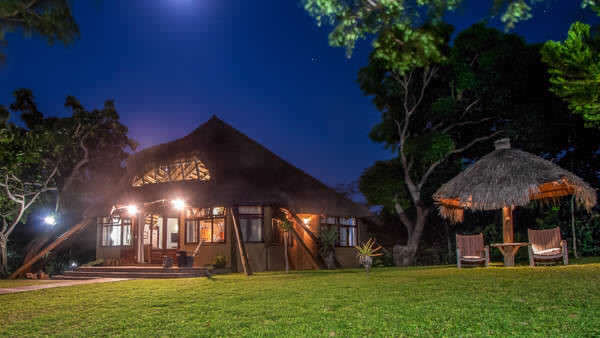 At Inhaca Lodge - You can Spend your days lazing in the comfort of your bright and airy chalet. Stroll around the picturesque tropical gardens. Take a leisurely swim in the crystal clear waters of the Indian Ocean and soak up the glorious African sun. Or, if you’re feeling energetic, take advantage of the water sports on offer, or join one of the fascinating tours of the area. Sip pre-dinner cocktails at the salt water swimming pool. Then tantalise your taste buds with an array of fresh seafood. From the fine cuisine to their unmatched hospitality, they will give you the idyllic getaway to savour life's natural beauty and pleasures. Free daily use of canoes and paddle boats. One free snorkeling trip to Coral Gardens per stay. (09H30. Depart – 12h00 Return. 14h30 Depart – 17h00 Return). Clients who want to do any of the free activities outside the scheduled times will be charged as per the price list. Tours can be organised to the lighthouse and the Marine Biology Museum as well as boat tours to Portuguese Island and Santa Maria. Wildlife in the Inhaca island area includes: Loggerhead turtles; Pelicans; flamingos; white faced owls; whimbrel and hammer tops.